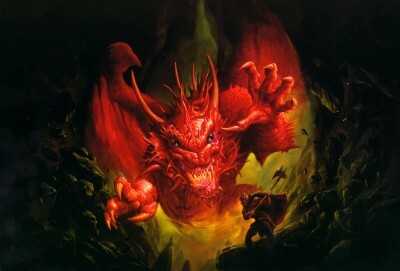 Angerbast is a Firstborn Red Dragon who fought against the invading dragons during the Dragon Wars. At one point, he assaulted the Blood Dragon Zarovich, and was promptly slain. However, Angerbast had written and created the Dragon Mage Tomes in advance, which his good friends Remulus and Romus (twin Gold Dragons bonded to the Dragon Riders King Yu and Pharadil) gave to an elven wizard named Mulgarda. Mulgarda read the tomes and became the world’s first Dragon Mage. When she reached level 20, she merged with Angerbast, and he was reborn. He also decided to dominate Mulgarda completely, and will therefore never change into human form in order to give her control of their entity. The Dragon Wars had ended when Angerbast was reborn, so he returned to a life of evil mischievings until forces from the flying prison Cloudhaven tracked him down and put him in eternal statis. But during a raid against the prison not long ago, all the prisoners were freed and Angerbast decided to stay in Cloudhaven to remake it as a new prison – with him as warden. All spells (both targeted and Area Effect) cast by Good creatures will be absorbed and heal instead of doing damage.